Ian Usher, a Brit now living in Australia, plans to walk out of his house with just his wallet and passport. According to a report on the BBC site, Ian "is selling his house, friends and job" on eBay. This includes all his stuff in the house. He apparently made this decision after his wife left him. Bidding has already started and will end on 5am BST on 29 June. You have to register in order to bid. 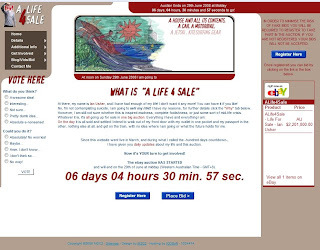 Go to his site "A Life 4 Sale" for more details.